Russia launches fresh diplomatic counter-offensive to win back influence lost after the Arab Spring. The first Russian-Arab Cooperation Forum took place in Moscow on Feb. 20. In attempts to regain the position in the region that it lost after the Arab Spring, Russia has been trying to revive both the Palestinian-Israeli and the Syrian regime-opposition dialogues. Experts are skeptical, believing Moscow’s activities will only help improve its image. Moscow waited three years for a meeting with Arab world representatives on Russian soil. As he opened the first session of the Russian-Arab Cooperation Forum at the ministerial level, Russian Foreign Minister Sergei Lavrov reminded the audience about the region’s key problems. Lavrov said that Moscow’s initiatives regarding those problems have, until now, been either rejected by the Arab world (as happened in the Syrian crisis) or hampered by Israeli obstruction (as in the Palestinian-Israeli process and the idea of a nuclear-free zone conference). 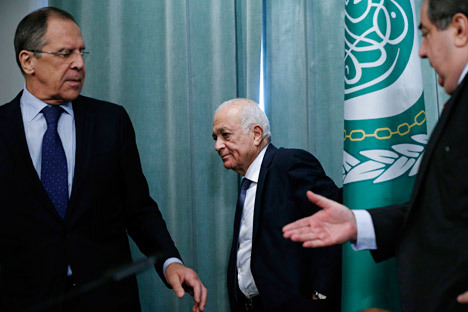 In his address to the Arab ministers led by Arab League Secretary General Nabil Elaraby, Lavrov made it clear that Moscow would not remain on the defensive: instead of fighting accusations of collaboration with the Assad regime, it is beginning a diplomatic counter-offensive. The situation in Syria — where the fighting between President Assad and the opposition has deadlocked — has justified grounds for this. In Moscow’s opinion, this makes the Russian idea of an internal Syrian settlement (as an alternative to a violent ouster of the Syrian regime with the help of outside forces) increasingly viable. “It’s possible to conclude that betting on a resolution by force from either side isn’t working. An understanding that dialogue must begin is increasingly gaining ground,” Lavrov said of the new trend. The Syrian crisis was a subject of a recent telephone conversation between Lavrov and U.S. Secretary of State John Kerry. Having diverged radically on Syria over the past six months, Moscow and Washington must now look for points of convergence. For now, their positions are still far apart. According to the Department of State spokesperson, Victoria Nuland, the Secretary of State (who will start a tour of Europe and the Middle East on Feb. 24) will take part in a meeting with the leaders of the Syrian opposition in Rome. On the eve of the Russian-Arab Forum, Sergei Lavrov announced the visit of the Syrian minister to Moscow, which is expected on Feb. 25. He added that the Russian side intended to discuss issues to be resolved, in order to start a dialogue in Syria. “We are working in this direction with the opposition too, and we have never stopped working with the government and with those who oppose it,” Russia’s foreign minister said. However, experts are skeptical concerning Moscow’s renewed activity in the Middle East. “The existence of a few dozen Arab countries in the world is very useful for Russia’s Foreign Ministry. First of all, this allows it to keep an army of Arabic-specialist diplomats on the payroll. Second of all, this gives Moscow an opportunity to be present among the strong nations of the world as a co-sponsor of the Middle East peace process, which is an honor — yet quite meaningless for the Palestinian-Israeli settlement as such,” said Evgeny Satanovsky, president of the Middle East Institute. “At the same time, none of this rules out the participants manoeuvring around Russia, which is exactly what we see today,” said Satanovsky. The article is first published in Russian in Kommersant.